It’s very strange to turn on the TV to images of havoc when ultimately I ended up having such a calm night in my neighborhood. If I hadn’t known it was a Hurricane I would have thought last night was just kind of stormy, not devastating. The mood was light where I lived. A small handful of people wandered out to bars to socialize in the stranger-than-normal calm of NYC. What’s funny is that the sensationalism in the news reporting is very easy to catch when it already feels in-genuine Looking at the TV screen, then looking outside my window to my calm street I wanted to shout: Liars! but knew that the storm really was brutal in some places. 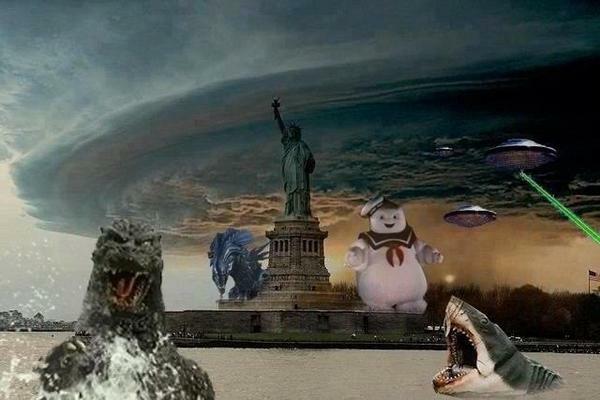 Hurricane Sandy unleashes her worst. But in all seriousness, I feel very happy to have escaped last night without any danger. And it’s provided some nice cuddle time with the boyfriend. Although he did make us watch the shining… on a night when things are already creaking and the power might go out at any minute. Can you imagine? !